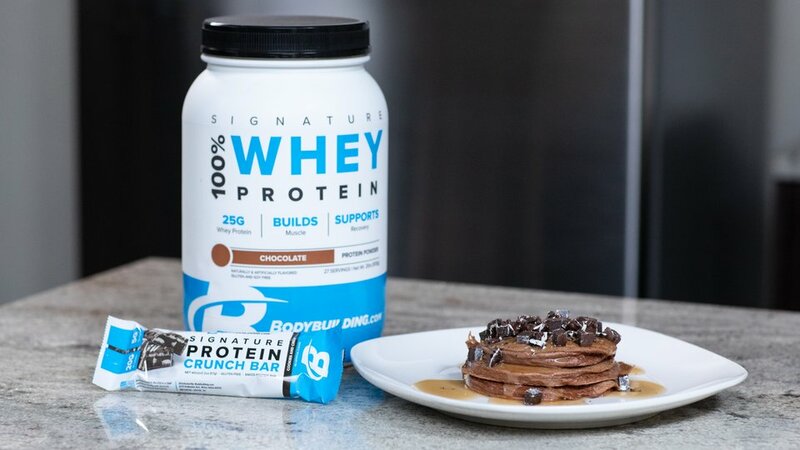 These high-protein pancakes satisfy your sweet cravings with cookies and cream flavors and fluffy chocolatey goodness. A decadent breakfast treat that fits your macros! Preheat pan or griddle to medium-high heat. In a medium bowl, mix flour, protein powder, cocoa, and baking powder. In a separate bowl, mix milk, Greek yogurt, and egg. Combine wet and dry ingredients, and gently mix until smooth. Spoon batter onto griddle to make six medium-sized pancakes. Cook for about 3 minutes per side. Divide pancakes and layer on two plates. Drizzle on maple syrup. Chop protein bar into small cubes and sprinkle on top. Enjoy!